One hundred and eighteen adult epileptic patients were registered and followed up for three months while on treatment in the outpatient clinic. The cost of epilepsy treatment was calculated for three months and adjusted for one-year period. Of the 118 patients, 54% had generalized tonic clonic, 13% simple partial, 14% complex partial, 8% myoclonic and 1% absence seizures. 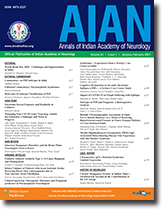 In 79% of the patients, interictal electroencepalography and CT Brain were done free of cost and in 22%, the scans were done at a concessional rate between Rs.350 to Rs.750. Generic forms of anti-epileptic drugs were distributed to the patients free of cost once in two weeks. The average cost of anti-epileptic drugs per patient per annum was Rs.204. The average total income per patient per annum was Rs.17,250 (range 0 to Rs.72,000). The total direct cost per patient per annum was Rs.1378 and of this 90% (Rs.1248) constituted travelling expenses to collect the drugs. the total indirect cost per patient per annum was Rs.2254. The direct and indirect costs of epilepsy treatment in a state Government Hospital was low and acceptable to patients below poverty line but unfortunately, the travelling expenditure was high. We suggest that the delivery of anti-epileptic drugs should be at the periphery and not in tertiary hospitals. This study aimed to detect anti-ganglioside antibodies in the sera of patients with Guillain-Barre syndrome and correlate their presence with clinical features, electrophysiological studies and outcome. Twenty patients with GBS were evaluated clinically and electrophysiologically. Serological assays for antibodies against GM1, GD1a and GD1b gangliosides were carried out by ELISA, Twelve patients tested positive; two had antibodies against all three gangliosides, one against both GM1 and GD1a, one against GM1, GD1a or GD1b alone were seen in two, five and one patient respectively. No significant correlation was noted between the presence or type of antibody with clinical features, electrophysiological findings and outcome. This study examined the concurrent use of psychotropic drugs on seizure duration during Electroconvulsive therapy (ECT). Consecutive consenting patients prescribed bilateral ECT (n=182) by the treating psychiatrist were considered for the study. The concurrent psychotropic medication (antipsychotic, antidepressant, benzodiazepine and lithium) was recorded. Motor and EEG seizure durations were recorded at threshold ECT session. The seizure durations were compared between the co-administered drug and control groups for each of the psychotropic drug independently using students' t-test. Concurrent antipsychotic or antidepressant drugs had no influence on seizure duration. However, the seizure duration was longer in patients on lithium (n=30) and shorter in patients on benzodiazepines (n=67). Prolonged seizures occurred more often in the former (26.6%) but less often in the later (12%). Polypharmacy in these patients precludes firm conclusions. Findings however, point to the need for discontinuing concurrent administration of lithium and benzodiazepines during ECT. Spinal disorders are the major cause of disability and poor Quality Of Life (QoL). This study attempted to measure Health Related Quality Of Life (HRQoL) Spinal disorders using a brief, generic scale. Consecutive subjects with spinal disorders (n=102) were interviewed using two scales Karnofsky Performance Status, Euro QoL EQ-5D and two statements from WHOQoL-Bref. The study found that the overall HRQoL in spinal disorders is not so good in most of the patients. Pain and impaired mobility maximally contributed to the poor HRQoL. Socio demographic factors like age, education, habitat had significant relationship with HRQoL scores. Average time taken for HRQoL measurement was less than 5 minutes. In conclusion HRQoL in spinal disorders is generally not so good and brief generic scales to measure HRQOL can prove to be useful for routine use. The very small numbers of acute ischemic stroke that can be effectively treated makes prevention of stroke a better option especially in a country like India. Hypertension is the commonest risk factor and control of even this is not effective. We are now looking at other options such as inflammatory drugs, ACE inhibitors, Statins, vitamins, new antiplatelet agents etc in a bid to prevent ischemic strokes. The borderland between neurology and psychiatry is fast disappearing - thanks to the description of neurotransmitter alterations in various psychiatric disorders and the development of rational pharmacotherapy based on such alterations. The attempt to find out a neural basis of psychiatric disorders started in Europe about one hundred years back by a group of neuropsychiatrists with extensive training in histology and psychiatry. Two names stand out in prominence - those of Emil Kraeplin and his close associated Alois Alzheimer (Figs. 1&2). Kraeplin (1856-1926) was a German psychiatrist who worked as a professor at Dorpat, Heidelberg and later at Munich. His major contributions were in the classification of mental symptoms and diseases, the description of schizophrenia and the provision of an academic milieu wherein colleagues such as Nissl, Jakob, Barany and Spatz flourished. His association with Alzheimer began at Munich and it is from his memoirs (translated in English in 1987) (1) and other writings (2) that much can be known about psychiatric practice in contemporary Europe as well as about Alzheimer as a person. It was Kraeplin who credited Alzheimer by ascribing the eponym Alzheimer's disease to the condition he described. Emil Kraeplin, indeed was the mentor of Alois Alzheimer. We report a rare case of isolated unilateral pupil sparing congenital third nerve palsy without any signs of aberrant regeneration. CT scan of brain and orbit did not show any structural anomaly except an extremely thin medial rectus muscle, which is probably hypoplastic. A twenty five year old lady manifested with spontaneously remitting cranial polyneuritis involving the facial and lower cranial nerves bilaterally over a period of four weeks. At admission, she only had right lower motor neurone type facial palsy. Blood investigations including serum ACE were negative. CT chest showed multiple nodular lesions with hilar adenopathy. Biopsy of the calf muscle followed by supraclavicular fat pad confirmed the diagnosis of sarcoidosis. We report a case of Acute inflammatory demyelinating polyradiculo neuropathy (AIDP), following infectious mononucleosis. A 12 year old girl presented with acute flaccid quadriplegia with bilateral cervical lymphadenopathy and enlarged tonsils six weeks after a febrile illness. Cerebrospinal fluid revealed albuminocytological dissociation and electrophysiology showed evidence of axonal-demyelinating polyradiculoneuropathy. Heterophile antibody test was positive and lymph node biopsy showed non -specific reactive hyperplasia. She was managed conservatively with good outcome. Creutzfeldt-Jakob disease is a neuro-degenerative disorder of central nervous system caused by infectious proteins called 'prions' and typically presents with progressive dementia and myoclonus. Here, we report a second ' probable' case from mid-Eastern region of India.